A recent study has shown sustained chiropractic care and home exercises produced better outcomes for back related leg pain (BRLP) than home exercise alone1. 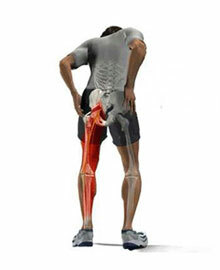 BRLP can be quite disabling, with an estimated 3 million Australians having back problems, including 0.2 million with sciatica2 . The study published in the Annals of Internal Medicine showed that patients who combined chiropractic with home exercises had better results than those who performed home exercises only. In this study, after 12 weeks of care the Chiropractic group had a marked improvement in their BRLP in addition to other secondary benefits measured like patient satisfaction, reduced medication use and an improvement in patient perceived general health state and global improvement. There was one criticism regarding the results which mentioned that after 1 year there was no difference in BRLP between the two groups, this implied that Chiropractic care was in the long run no better than the take home exercise group. So why have Chiropractic when you can do take home exercises and get the same result I hear you ask. Easy, who wants to wait one whole year for their pain to improve, which logical health practitioner would tell a patient “don’t worry about going to the Chiropractor, do these exercises at home, wait a year and it’ll be gone”. No patient will voluntarily wait a year for low back pain with leg pain to go away when a Chiropractor can make a significant difference over 12 weeks. Do you know what else? The other secondary improvements I mentioned above, they were still there after a year too. So patients were satisfied, experienced a better health state and global improvement and took less medication, what a fantastic result. Australians are increasingly turning toward chiropractic care to manage a range of musculoskeletal complaints with over 215,000 visits to a chiropractors occurring in Australia each week. Make an appointment with your local CAA Chiropractor today. Gert Bronfort, et al., Spinal Manipulation and Home Exercise With Advice for Subacute and Chronic Back-Related Leg Pain. Ann Intern Med. 2014. 161(6): p. 381-391. AIHW, Arthritis and other musculoskeletal conditions across the life stages., in Arthritis series no. 18. Cat. no. PHE 173. AIHW 2014: Canberra.